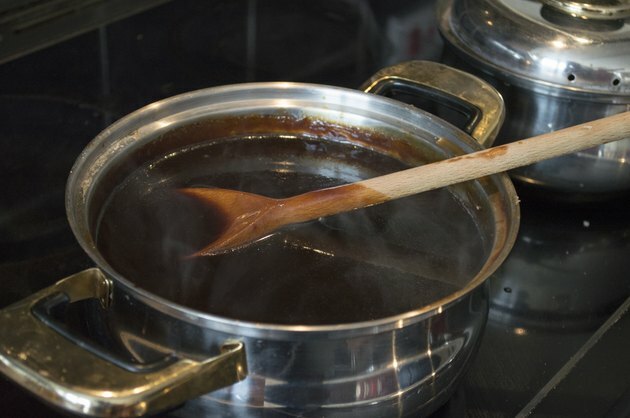 Make a glaze by thickening your sauce or drippings with something already glaze like, such as syrup or preserves, and you save yourself effort and time. But you also add sugar and possibly additives. Avoid that by reducing the liquid you already have. Reducing a liquid means exactly what it sounds like -- causing it to decrease in volume. A reduced-liquid glaze can be as thin or as thick as you want it to be, according to how long you cook it. Pay attention when making a reduction, because a glaze can burn if you boil it down too fast or too far. Spray a shallow skillet with nonstick cooking spray. This is not strictly necessary, but it will help keep stickier liquids from scorching and make cleanup easier. Add the liquid to the skillet and turn the heat to high. Stir the liquid as it comes to a boil, making sure to scrape the bottom of the pan to keep any of it from sticking. Reduce the heat to medium-high and continue cooking. Do not turn the heat any lower, because the liquid has to boil to reduce. Simmering it just keeps it hot. Stir the liquid frequently, and keep an eye on both its volume and its thickness. If it hasn’t reduced at all or become any thicker after five to seven minutes, turn the heat a little higher. Keep stirring and boiling the liquid until it has reached the volume and consistency you desire. Add a splash of alcohol to your liquid to reduce it more quickly because this helps the water boil off faster. Never try to reduce a liquid over very low heat if you are in a hurry. OChef: What Does it Mean to Reduce in Cooking?